Absence makes the heart grow fonder, or so the saying goes. 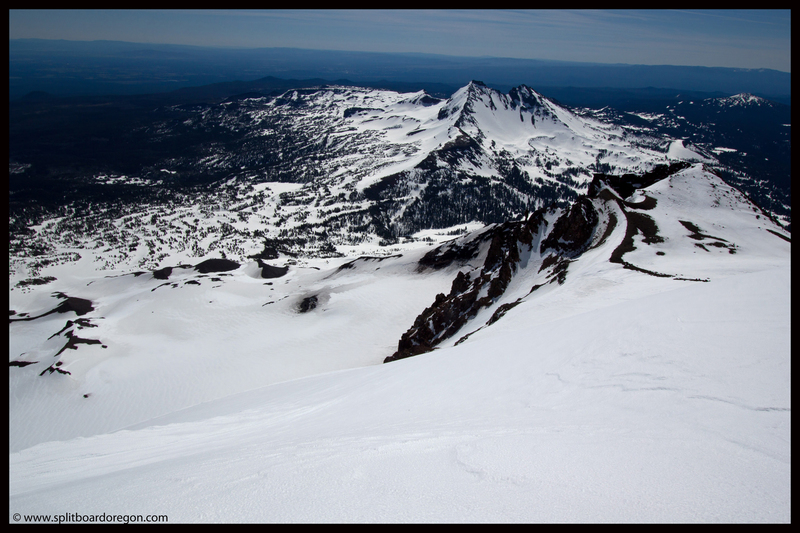 Four years had come and gone since the last time Todd and I visited the south side of South Sister, and I found myself longing to make a return trip for a corn harvest. The timing for such a trip however proved to be a bit difficult. After a stellar weather window in middle May, the sun made only a few minor appearances over the next few weeks, making trip planning extremely frustrating. A brief return to winter, with snow showers in the higher elevations and a generally unstable air mass seemed to be setting up for a repeat of last year. Plans to head to the mountains repeatedly were put on hold while the weather did it’s thing. 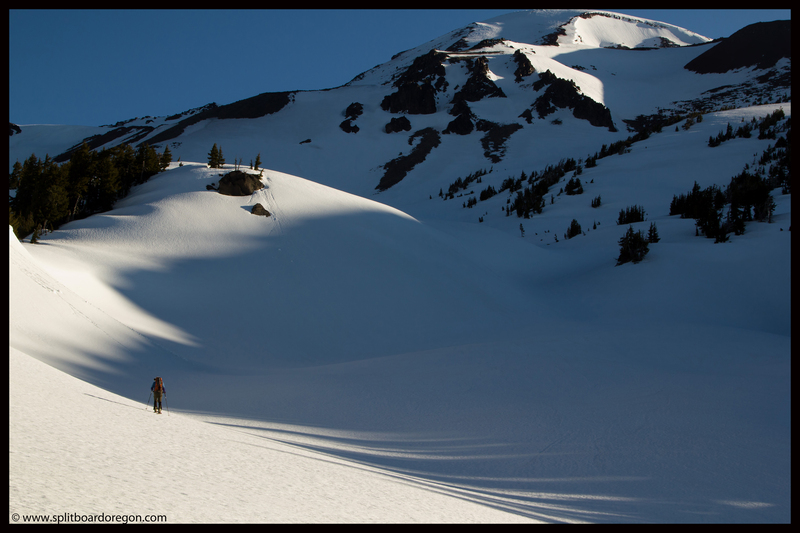 Finally, a return to a more normal weather pattern was in the forecast, and a mid-week ski on the South Sister seemed like a reality. Plans were made to camp above Moraine Lake on Wednesday evening and summit and ride Thursday morning. As it always does, leaving work early for skiing left me feeling very satisfied – but this time more so than normal. Having taken on several large additional responsibilities lately, I was in a dire need of a mental break and a visit to the backcountry. After a brief stop at the Salt Creek tunnel due to construction, we arrived at the Devils Lake trail head shortly after 5 pm, and found a wide spot on the shoulder to park on. 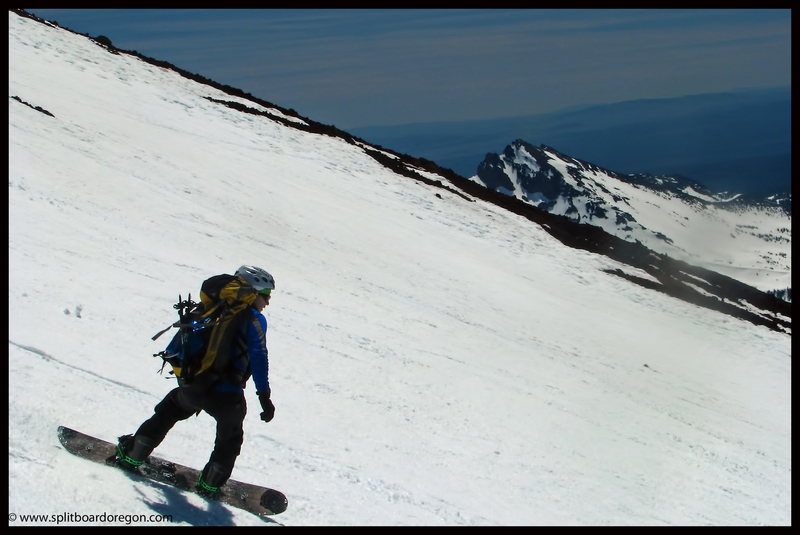 Conditions looked good, with the upper mountain holding more snow than in years past due to the late Spring storms, and over two feet of snow along the road. After a brief chat with a few fellow enthusiasts who had skied the peak earlier in the day, we started skinning up the Hell Creek drainage. Judging by the fact that no other cars were at the trailhead, it looked like we’d have the whole mountain to ourselves. 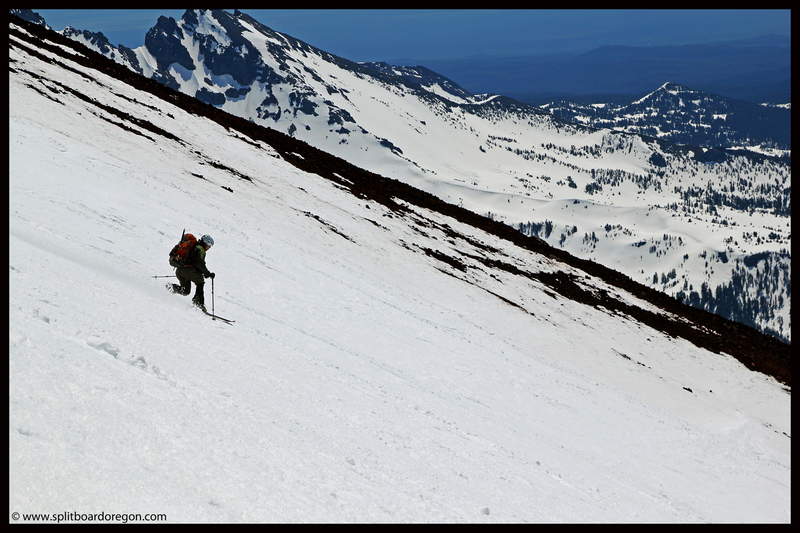 The last pitch below treeline is somewhat steep and always fun skinning, but seemed to be a bit easier this year. Popping out onto the flats above Moraine Lake, the mountain was looking good. 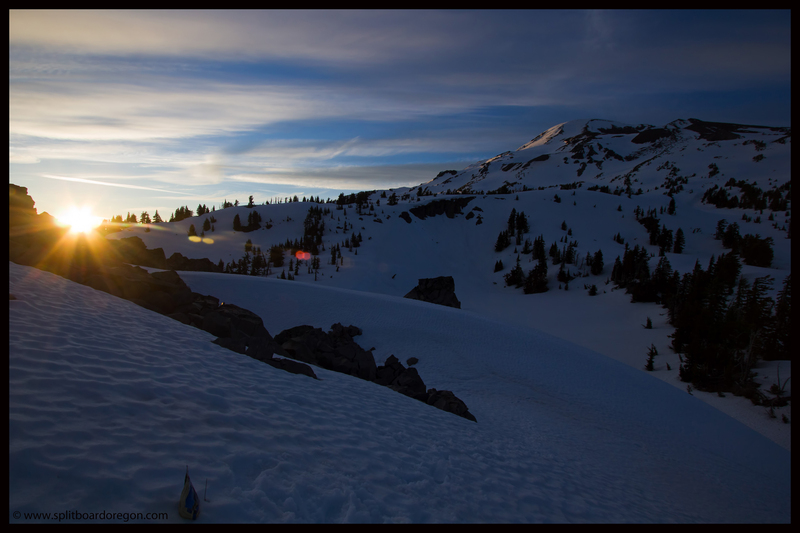 Another 20 minutes of skinning brought us to a favorite campsite not far from Little Broken Top. Plopping the heavy overnight packs off our backs felt good, and we quickly went to work setting up a tidy campsite. Todd had his bivy while I opted for a lightweight solo tent. 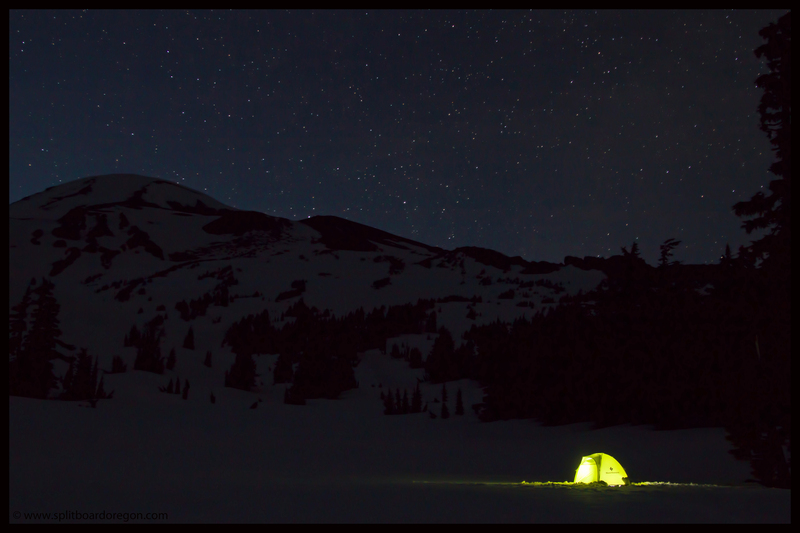 The light to the west looked incredible for photo taking, so I quickly boiled some water in the Jetboil, made up some freeze dried Mac ‘n’ Cheese and took off with my dinner, camera & tripod. 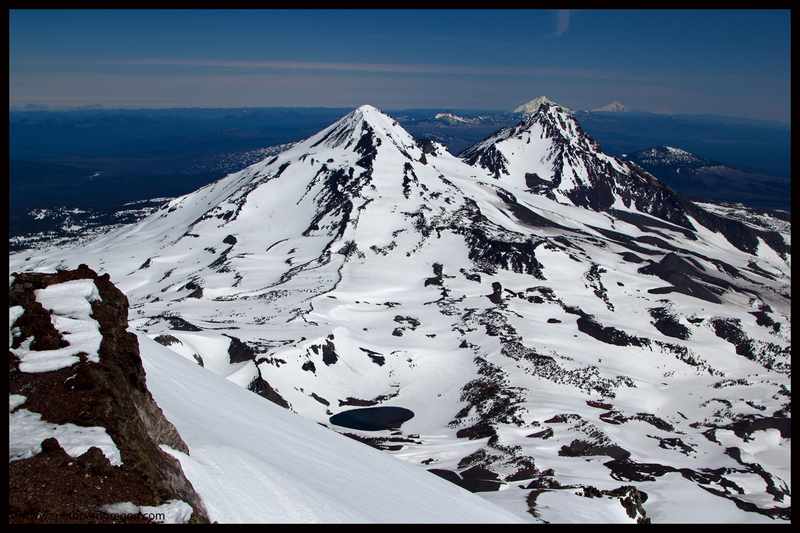 A few minutes later on top of Little Broken Top, I had a commanding view of the mountain and surrounding vistas…. 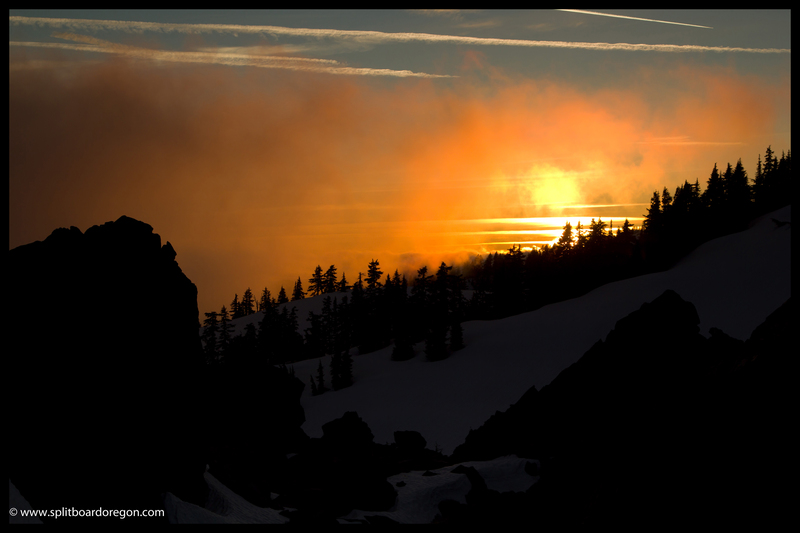 The final pitch to the summit rim is always a slog, and this trip was no exception. I resorted to counting steps and snapping photos at breaks, but we still seemed to not be getting any closer. Finally, as in years past, a few more steps, and finally we arrived at the flats on the summit rim. Todd was suffering a few effects of altitude, so I booted across the plateau alone and enjoyed the spectacular views to the north of the remaining sisters and beyond. 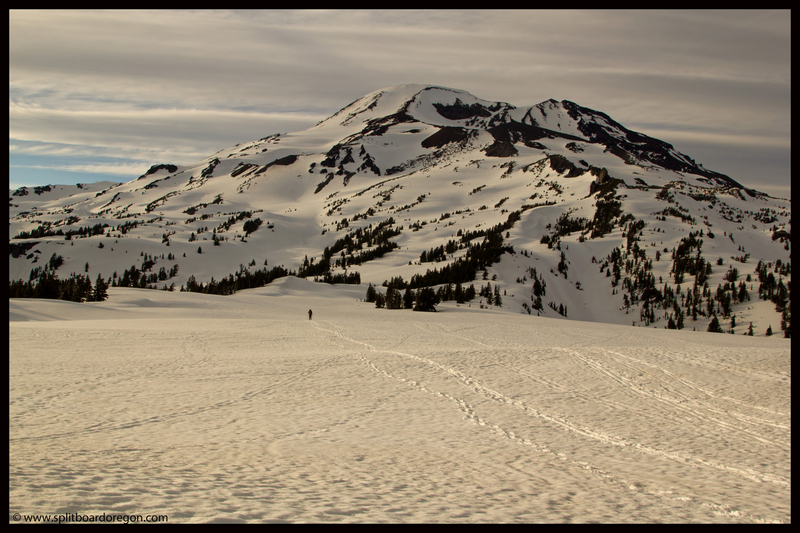 To the north, Mt Adams was plainly visible…. After enjoying the views from the summit proper, I hiked back down and traversed the flats, rejoining Todd on the south side of the rim. He was feeling better and it looked like the snow was finally starting to corn up top, just in time for our ride down. We dropped off the top around 11:15 just as the upper slopes began to corn. The first few hundred feet were a bit crunchy, but the rest of the ride was amazing. On the descent, we kept towards riders right, and found smooth corn on the Clark Glacier. 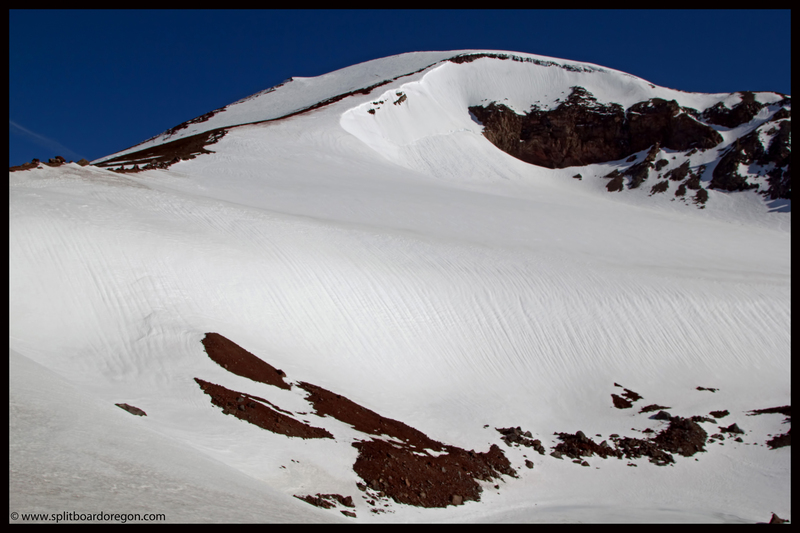 In fact, the snow was some of the smoothest, sweetest corn I’d ever ridden on South Sister. The Clark Glacier was in really nice shape, and several steep slopes and pitches provided excellent riding. Several thousand vertical later, we ripped our way right back to camp, and I literally took my board off my feet at the tent (one of the things I love about camping on the hill). Shortly there after we had camp packed and were skinning out the flat pitch above Moraine Lake. The ride back down Hell Creek was mostly fun, and led us with turns right to the road (with only one short piece of walking). Back at the car after an excellent day of turns, I bid Todd farewell as he headed for home. With my gear in the car, the celebratory beer would have to wait for the evening, since I had plans for another ski day on Mt Bailey the day following. 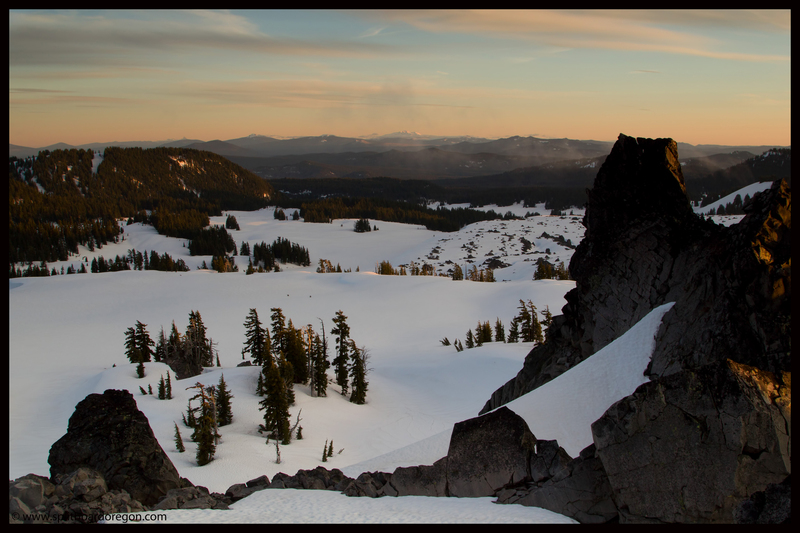 Gear loaded, I headed east on Cascade Lakes Highway past Bachelor & Broken Top for another adventure in the Oregon Cascades.